Culinary historian Jean-Paul Aron said "in the polyphony of gourmet, [the roast] is the chorale: one can imagine it being played on the organ." The boy liked his roasts. ;) The roast was the main event on Titanic's 1st class menu. It the one course that the authors of the book recommend you don't skip and I don't intend to. 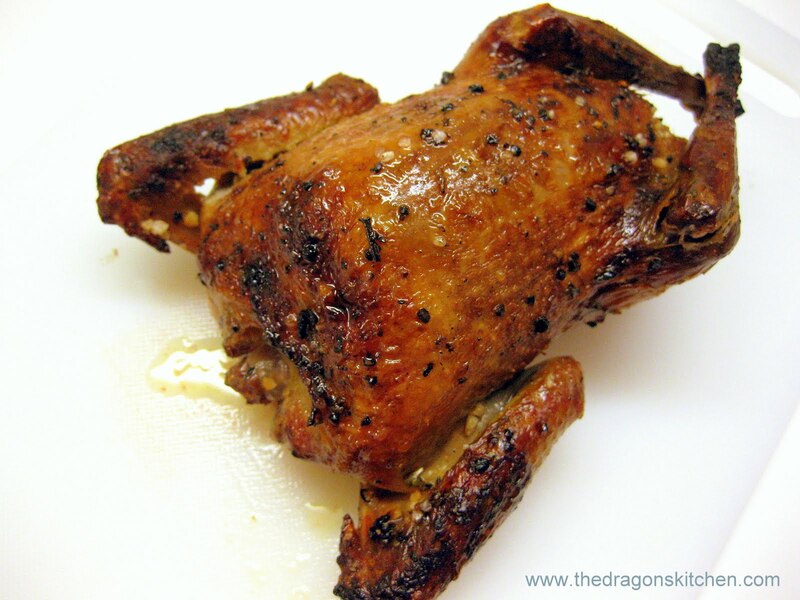 Squab isn't easy to find so you can always substitute any small bird such as partridge or Cornish game hens. I'm lucky to have a fantastic butcher who sourced local squab for me. Now, squab is a little bird and eating them, in polite company, is going to be tricky. I will encourage my guests to leave politeness aside for this course and dig in with their hands to be able to enjoy all of it. What's a dinner party if we can't get our hands a little dirty, eh? I'll provide bowls of warm lemon water so guests can clean their hands after they've enjoyed their squab. Enjoy! 1. Rinse and pat dry squab, inside and out. 2. In bowl, mix together oil, garlic, marjoram, salt and pepper. Rub over squab, inside and out. Truss and secure bacon slice over each squab breast. Place in roasting pan and cook in 450°F oven for 15-20 minutes or until juices run pink. Remove and discard bacon and broil for 2-3 minutes or until well browned. 3. Remove from pan; tent with foil and let rest for 10 minutes. Place roasting pan over high heat. Stir in Madeira, red wine and chicken stock. Bring to boil, stirring to scrape up any brown bits; cook for 7-8 minutes or until reduced to about 1/2 cup. Strain and keep warm. 4. Watercress: In large pot heat 2 tbsp of the walnut oil over medium heat. Add garlic and cook, stirring for 2 minutes; increase heat to high and add damp watercress. Cook, stirring for 1 minute or until wilted. Toss with lemon juice, salt, pepper and remaining walnut oil. 5. 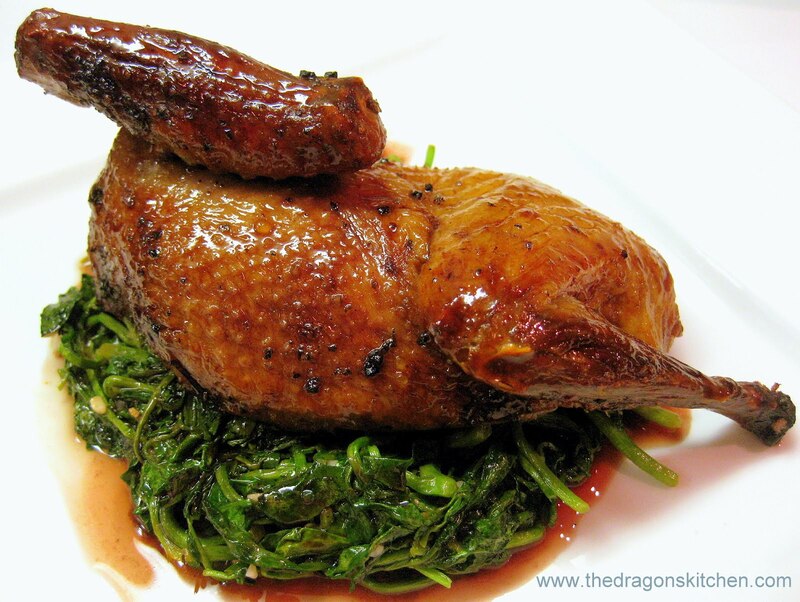 Make a nest of watercress on heated platter; halve each squab, removing backbone and arrange over top; serve with sauce on the side. Never eaten squab, be interested to know what you think. Thanks for the link to Brady's. Will have to check them out. Unable to cope with the market, but can certainly go to Waterloo. This looks perfectly cooked! I like squab but I never made it at home. The little bowls of lemon water sound perfect for a dinner party. I'm glad to see you cooking squab. I don't know why people have a hard time finding it. We have been raising it here in Belwood for almost 25 years. I hope your customers enjoy.